Humans were born millions of years ago in various regions of the planet without contact with each other. As a result, there was a multiple birth of languages, of sacred religions, of customs, of ways of lives, of names of people, etc. A list of all this should be done and raise the question what did they try to understand, to discover, to make a reality of a way of life? All this is coming together, trying to make a common sense, a new future of humanity on planet Earth, known now in her totality. Have dreams and believe deeply in them. Strong dreams always come true. To order: Phone: 800-942-7617. For those of you who are interested in my life, there is a beautiful biography which I love very much. Order from www.robertmullerbiography.com . [GMW #1274] Youth Is Evolutionary: It Contains The Infinity Of Evolution, Of All Earlier Humans! Youth is evolutionary: it contains the infinity of evolution, of all earlier humans! They are not told that. They are not asked to produce their views, their evolutionary contribution they expect. With the elimination of militaries and armaments in the world, enough money would be saved (one half of all the expenditures of governments) to ensure a fundamental, basic income to all humans as Franklin Roosevelt said shortly before his death. For a long time I believed in forces of evil, but at the end of my journey I feel that such belief is doing them much honor. The best is to ignore them. They will wither away for lack of recognition, of attention. living creature on this planet. At the end of World War II young people of the region of Alsace-Lorraine where we have changed nationalities so many times and killed brothers who lived on the other side of the border we decided that this should have an end. Well we had the help of a wonderful local elderly gentleman, Robert Schuman, who had become Minister of Foreign Affairs of France. He established a great friendship with the Prime Minister of Germany, Konrad Adenauer. They decided to launch the idea of a united European countries! This took a long time, but it was finally done as a European Union of fifteen countries. All the borders between them were suppressed. "I was born in a place called the corner of three borders, namely France, Germany and Luxembourg and when I was a kid at Christmas I was given a bicycle. But when I used it I was always running into one of these borders. I decided that if ever in my life I would be given the opportunity to suppress them I would do it. When I became a minister in France I decided to create a European Union in which all borders would be suppressed. Later ten more countries were accepted as members of the European Union and had to suppress their borders too. We requested the canonization of Robert Schuman as a saint. We learned on that occasion that he considered that to achieve peace was not the end but had to be reinforced by cooperation and love. Be optimistic always. Do not let negative thoughts invade you. Pessimism is like a sickness. You must keep it away. A good, healthy human is always optimistic. Health optimism should become a new science, taught in Faculties of Medicine. Dear reader, don't hurry and don't worry. Talk to your body's beloved organs. When I talk to my heart and ask it to beat more slowly, it does so. As I write this early in a morning of October 2005, I have the pleasure to note that my heart beats 64 times per minute, which is its ideal. This is why their role is often minimal, diminished or nil. An optimist and a pessimist may both land in the same ditch, but the optimist's journey was at least a happier one. When I was a child we had to sing and dance in front of Belgian troops marching on Sunday mornings in the city where I was born. When we moved to France, we had to sing and dance in front of French troops and when the Germans conquered France, we had to dance in front of German troops in our province of Alsace-Lorraine! Thanks God the European Union has put an end to all that. May a World Union do the same for the entire planet. Optimism is to believe that the best can be achieved for oneself, for one's family, one's community, one's profession, one's country, all humanity and for Mother Earth. We are living in the worst of times and the best of times. The worst of these is that for more than fifty-five years, nuclear weapons have threatened the earth and everyone on it. Testing and production have caused environmental degradation everywhere on the planet and created the possibility of a nuclear war. It is absolutely imperative that we eliminate, eradicate, and forever destroy all nuclear weapons from the face of the earth to keep it the paradise we were given at birth. In my view, after fifty-five years of service in the United Nations, this all points to the utmost urgency and absolute necessity for proper Earth Government. It should be number one on the agenda of world affairs at the entry into the third millennium. There is not a shadow of a doubt that the present political and economic systems -- if systems they are! -- are no longer appropriate and will lead to the end of life's evolution on this planet. We must therefore absolutely and urgently look for new ways. The less time we lose, the less nature we will destroy. I would urge therefore that immediate consideration be given to the proposals offered by Douglas Mattern. It's a matter of life and death. The UN should be enabled to conduct worldwide public opinion polls on all major segments of its agenda. I urgently recommend the creation of a World UN Agency of Public Opinion. One of the greatest statements on optimism is a letter of Ludwig van Beethoven, the Heiligenstadt Testament in which he informs his brother that he will lose his hearing, become deaf. He almost shouts in it: "But I will show the world what I am capable of". And it is from then on that he composed his greatest symphonies. Advancing a conscious global evolution. Driven by the forces of love, the fragments of the world seek each other so that the world may come into being. Love alone is capable of uniting living beings in such a way as to complete and fulfill them, for it alone takes them and joins them by what is deepest in themselves -- Pierre Teilhard de Chardin Daily Good of CharityFocus. Optimism does not end with death: many of our cherished causes will succeed only after our death. But this is no reason not to try, not to be early prophets paving the way. And we should never claim the right to success or abandon if we do not succeed. A great waste of human evolution is done by people who give up too soon "because it did not work." Never do that, please. Hi to friends I haven't met yet. Having read a very nice, deeply sensitive book on the River Sarre, by the young mayor of my town, Sarreguemines (in German Saargemund, the mouth of the Saar) and having written myself my doctorate thesis on the Saar Territory years ago, I proposed to proclaim an International Year of the World's Rivers and Rivers Waterways and to create a World's Waterways Agency. It is one of the most important, sensitive global natural networks of our planet. Put an optimistic thought in your head and it will chase the pessimistic one. "The life I touch for good or ill will touch another life, and that in turn another, until who knows where the trembling stops or in what far place my touch will be felt." To add an Earthcracy (governments by or of the Earth) to democracy (demos, the people, cracy, government). The greatest division in the world is between optimists and pessimists, life-believers and life-deniers or doubters. The only positive gain that came out of World War II was the creation of the first world-wide but imperfect organization in all human history, namely the United Nations. Instead of waiting for a hypothetical World War III, why not strengthen the United Nations or create a new world-wide organization against all wars? An optimist is someone who sees a possibility in every problem. A pessimist is one who sees a problem in every possibility. When Paul Hoffman, the Administrator of the US Marshall Plan, was appointed head of the Special UN Fund for Economic Development I showed him a chart and said to him: "Why didn't you make the Marshall Plan repayable by the European Countries once they had recovered from their losses in World War II? The United Nations Special Fund should be made renewable: once developing countries will be economically well they would repay the aid received to the UN Special Fund to help other poor countries or disaster areas around the world. Alas, he and the UN did not do it. May other aid giving countries consider this way. Pessimism and optimism have both their nutrients: pessimism seeks everything bad and wrong to feed itself; optimism looks out for everything good and right for nourishment. "Many a false step was made by standing still." Love for nature seems to be a revival of culture of the human species. During the fortieth anniversary of the UN, of which I was in charge, I underestimated the number of heads of states who would attend the celebration by 14 percent. In view of this, I decided to increase my overall optimism by the same percentage. In view of the proceeding I recommend that the International Railroad Association become a full specialized agency of the Unite Nations. Why? Because added to the UN International Civil Aviation Organization and the United Nations Maritime Organization. This would be a substantial progress toward a well-conceived World Transportation Agencies System which could do wonders for a well-coordinated World Transportation Policy, coordinated, stabilized, etc. Only missing would be a World Transport Organization, which should be created too, above and beyond the transport concerns of the regional economic commissions of the United Nations. I have become known as the optimist in residence at the United Nations. When I made the optimistic prediction that the cold war would end before this century was over, I was considered a fool. Later delegates and colleagues congratulated me for my prophecy. As an answer I told them what my new optimisms were. I hope this finds you as well as can be and happy! I have good news! I spent a fantastic 15 days in Greece preparing for a new group of Robert Muller Schools and using our Balanced Beginnings in the Athens Nurseries! I was on the radio for an hour interview with an audience potential of 400,000. That's a lot! One man who was listening got on a plane and came to the Conference! He told us after he arrived. The Conference had more than 400 educators and others interested in early Global Education. They intend to begin a private Robert Muller School and will have one in operation within a year. There are 44 persons involved in that project. Since I was there for 15 days, it is difficult to write all that was interesting for you. It's too much. But it has spurred us on to greater measures around here. We are planning Balanced Beginnings Seminars for pregnant families. We always have orders coming form all around the world, but it is through word-of-mouth or our website only. Now, we think it is time to "push" a little harder. WE know there are babies and children who NEED this education! New! Update of Good Morning World Blog - Volunteer Help Most Welcome - Take GMW Poll #1 - See below for more information. We have not yet come to a self-regulated stage of the human world society, with proper relations with the Earth, with the heavens, with our past and future, especially the long-term future. Our power over matter, the scientific and industrial revolution, our demographic explosion are still too recent to enable us to fashion, to conceive the right future, but it will come. The United Nations is a first, feeble, but very important step toward it. As a great writer said, the United Nations is already our future world government. "We will love each other beyond our life, for love is in the soul and the soul does not die." One will not even recognize the place he occupied." Optimism and pessimism reach even into death! A new blog is being created for each day's Good Morning World idea dream. With a few volunteers the past almost 600 days of blogs can be transfered to the new blog and labels can be created for each blog added. Volunteers need email and web access and willingness to learn a few basic steps - no web development skills needed thanks to Googles new tools. If you are interested in helping please reply to this email or click here. Take a look at the new blog here and take Poll #1 - How are you nurturing a better world for everyone - People & Nature? The poll is open for the next 6 days. Suggestions for more options for Poll #1 are appreciated and suggestions for future polls are most welcome - reply to this email or click here. Also suggestions for labels to categorize each day's Good Morning World would be very helpful. Please think about past Good Morning Worlds and what categories come to mind. What categories would be helpful for people looking for various types of ideas and dreams. See the labels in the new blog clicking on a label will then list all good morning world's with the selected label. Send suggestions with a reply to this email or click here. Every conceivable celebrations must take place in the world, in capitals, in cities, in villages, in churches, in hamlets, in families to help at long last the Earth become Paradise Earth. Never had such a thing happened in human history. It was at long last the birth of a united, loving human family on the most beautiful planet in the universe, the birth of a Civilization of Love. Do not drop out of your self. "The egocentric ideal of a future reserved for those who have managed to attain egotistically the extremity of 'everyone for himself' is false and against nature." "No evolutionary future awaits man except in association with all other men." "In the most general form and from the point of view of physics, love is the internally affectively apprehended aspect of the affinity which links and draws together the elements of the world, center to center. Love, in fact, is the expression and agent of Universal Synthesis." I am sometimes called an 'astonishing optimist'. What is so astonishing about being an optimist? Is not life itself an astonishing proof of the Creator's incredible, endless optimism and patience? People should be elected by all countries to represent that country in the UN General Assembly if a People's Assembly is not created. Optimism is simply optimum living. And who does not want to live an optimum life? If you do not look at least once a day to the sky, to the stars, to God, to a flower or the face of a person you love, you have not really lived and exercised the marvelous ministry of life entrusted to you by God. I do not have to dream what is possible or what I can implement, not at all. My dreams can induce other human brothers and sisters to implement them. They might live at a time when it is easier, when humanity has become ready and receptive to dreams such as mine. Depending how we look at it, it is always the best of all times and the worst of all times. In my view it is always the best of all times to do better. We must be infectious optimists, inspiring, uplifting, contagious, irresistible optimists. keepers of our brothers and sisters. My dearest 83 year young Aunt Mary Brightwell just passed on 14 May 2005 and she was the happiest, most spontaneous person I have ever known. Never complained, always laughed and told you either how great you were or a joke. She laughed so much even her parakeet could imitate her laughter. On her wall in her bedroom her daughter found this poem which is exactly as she lived each and every day? how lucky I was to have her happiness and smiles around me all my life. I WELCOME THIS NEW DAY. IT IS MINE TO SHAPE AND TO MOLD. This is a new day, mine to use, to fill, to live as I see fit. How it unfolds is up to me. The choice is mine. I can be miserable, or I can have a great day. I can doubt, or I can have faith. I can fear, or I can have faith. I can feel depressed, or I can express the joy that is inherent within me. I can fear, or I can trust ? myself, others, God. I can complain about aches and pains, or I can affirm God's perfect life within me. I can dwell on loss, or I can seek new interests, new joy in living. I can criticize others, or I can accept and bless them and enjoy happy and harmonious relationships. I can harbor old grudges, or I can forgive. I can speak of lack, or I can affirm God's never-failing supply. I can give up, or I can make a fresh start. I can go it alone, or I can depend on God. How does one deal with pessimists? Ignore them or inspire them and make them work. Give them your example and show them positive results you have obtained. At a meeting of the yearly Freedom Day on 17 March 2005 in Costa Rica a friend recommended that I should create a Robert Muller World Campaign to suppress all armies and weapons on Earth and create at long-last Paradise Earth. Well, I will try to do it with my ideas and dreams. Optimism and pessimism are forms of imaging, of thinking. The image, the thought is the first step towards a new reality. The Greeks held and the Hindus hold the view that all reality is the product of thought. In Hawaiian language Hana, i.e. action, means 'movement following a thought'. Idea 6730: Cultivate our passion for life, for peace, for a divine life on our beautiful planet Earth. Idea 6731: A constant observation and study of our life in a notebook or daily journal. Idea 6732: Knowledge of ourselves. Idea 6733: Love for ideas and positive actions in our life. Idea 6734: Love of positive dreams and ideas to make it Paradise Earth. Idea 6735: Be proud of our visions. Idea 6736: Never accept defeat or to give up. Idea 6738: Visualize positively our entire life and what we will expect from our retirement. Idea 6740: Do good in as many ways and fields we can. Idea 6741: Be a deeply spiritual cosmic being who will play a role, even after life as a spirit. I have been called a desperate optimist! My book New Genesis is apparently frightening because it denies humanity the freedom to commit suicide! Humanity has a pretty good record of what has been achieved over the centuries and millennia and it can be very proud of it. But humanity has had a very poor almost total neglect of a record of what has not been achieved. Neither has humanity an idea or a view of the future of our Earth which is being fast destroyed by a growing business and money section of humanity. "Vanity of vanities, all is vanity." Yes, dear pessimist, including your saying it! The role of height, of being closer to heaven, to God, to elevated truths are given by the Hopi Indians with a feather from the top of the head of an eagle, which is closest to God, to the Great Spirit. We should create a new family or world group of all peoples living on mountains. The Hunsa peoples who live on the highest mountains have longer lives, up to 110 to 140 years. Perhaps the fact of living my old age on Mt. Rasur in Costa Rica would add a few years to my life. As a result, all the vital forces will be mobilized and a successful life will ensue. Since we live, why not try to live to the fullest with all our means? I couldn't agree with you more that humanity will succeed and that we are entering into a new great beginning. I wanted to share with you the following article I wrote a short time ago. Team Humanity can save the World! 2,000 years ago we were told to "Love One Another". That there are many people on the planet who are not loving others is sadly true. They love some people; they love people that look like them or that are from the same geographic location as they are or that are of the same social standing, etc. but they do not try to understand and love everyone with spiritual love that can see mistakes and errors being made, but have true compassion for all those who live and breathe. There are still so many whose lives are dominated by strictly materialistic values and who are struggling with all the lower impulses that personalities can be subject to, including thought lives dominated by the illusionary thoughts of the various theories and dogma that create separation and division amongst us that are rampant in the world today. Those still in the throes of erroneous perceptions of reality fail to see the divinity in themselves and all others they encounter. But limited thinking can be expanded! Hearts can be opened! Mankind can begin to truly "know itself" as an outpost of the consciousness of Divinity and thus each of us is united with all others because we all stem from the same Source. Are there now enough of us on the planet at this time expressing spiritual love or Goodwill toward one another in our daily lives? Are we truly "loving one another"? If so, perhaps we could be looking for the next 'keynote' that will be given out for the future. Perhaps the idea for humanity's future might be expressed as "Unify With Each Other". 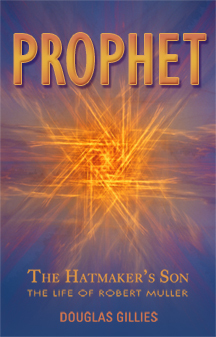 Only this thought of unity, based on the scientific fact of the Oneness of Life, will begin to make the expression of the Brotherhood of Mankind an accomplished fact on the physical plane. All is energy in some form or other and the entire Universe if one giant energetic expression. We are all a part of it. This fact must be expressed in the daily thoughts, feelings and actions of a large majority of people to change the world. Brotherhood is not an impossible idealistic vision of the way we would wish things to be, it is a FACT in nature. There is only one human kingdom on this planet and we all belong to it. Once this unification has occurred with enough of us present on the planet, the unifying with the other kingdoms in nature will proceed and world wide recognition of the essential Unity of all Creation can occur. Perhaps the most pressing need at this time in our planetary life is for a majority of people to unify in consciousness with all other humans on the planet so that we may begin working together for the good of the whole planetary life. If there is to be a tipping of the scales toward expressing the Divinity within us and the practical expression of Brotherhood to become widely accepted throughout the world, it is up to those who KNOW to act now! To fan the flame of Truth wherever we see it being expressed. To throw ourselves wholeheartedly into the battle and to accept the World Task as our own. Humanity has already developed the intelligence; the love aspect is somewhat present if not yet perfectly expressed; and now our essential Oneness can begin to become an accepted idea in mass consciousness. The failure of many of the world's religions who teach division and separation to thrive, and the fact that they have lost authority over the minds of large numbers of the masses, especially the young people in the world, is testament to the fact that the hearts and minds of many have simply outgrown the old ways of thinking. Thus, a tremendous opportunity for the Light has opened up. Will we recognize this opportunity and act in time to sway the balance toward unity? If we accept this idea of "Unification with each other" as the keynote or goal to be striven for in the foreseeable future, we will need to carefully plan what steps can be taken and in what order they should be taken, to help bring this subjective reality to the surface of humanity's consciousness and inspire the desire to see it expressed across the globe. This unification requires sacrificing our lower personality prejudices and individual or national grievances and reaching up into our higher natures that recognizes the wisdom of the good of the Whole. A recognition that behind all the outer differences we humans have, the true identity of all of us is identical! That is the job we have been entrusted with: to be stewards and to help the Earth reach it's full potential. 'Team Humanity' can save the world. Have confidence, give priority, increase your love for your miraculous body. It is your greatest, most important treasure and life support. Take some time to speak to, to love your heart, your eyes, your hearing, your brain, your hands, your legs, your lungs, your stomach, your taste, your liver, etc. Do not overwork them and ignore them. We should be the doctors, the lovers, the caretakers of our miraculous body and its components. They need it. When I joined the UN after World War II, I was a very pessimistic young man. Having seen the horrors committed between two highly civilized, white, advanced countries, France and Germany; having had a grandfather who had five successive nationalities due to three wars (French, German, French, German and French again) without leaving his village; having had a father who was twice a French soldier and once a German soldier; having seen half of my cousins in French and the other half in German uniforms, with the possibility that they might kill each other. I wondered how a world of black and whites, of communists and capitalists, of poor and rich, of 5000 languages, 2000 religions, so many nations and ethnic groups would ever make it without another world war. In my view such a war would break out in less than twenty years. Today, in 2002, I am an optimist who is convinced that humanity will succeed and that we have a great, incredible third millennium before us. What was achieved by the United Nations during the past fifty-five years, would have seemed inconceivable to me in 1945. I have told the story of my growing optimism and offered my ideas in numerous books, articles and speeches. I have done my duty as one of the first world servants during an entire adult life in the first universal, global organization of this planet, the United Nations. I thank God for having given me that privilege and opportunity. All builders and building companies around the globe should be considered as potential Earth and nature destroyers. They must be controlled and prevented from destroying the Earth for the mere or main purpose of making big profits. This new control should be instituted world-wide. At the end of World War II it was estimated by a pessimistic UN that decolonization would take from 100 to 150 years. Well, it was done in 40 years. We cannot leave constantly or primarily the rest of the world and of humanity 'outside' of our minds. What happens to relations within nations will now also happen to relations within the world. Even if they proved to be wrong, optimists would nevertheless be right because pessimists would have made things worse. It was great that my friend Douglas Gillies wrote a biography of a good part of my life to show what a human being can achieve from behind the scenes, without being known and having a great name. But I must now give one further great lesson and example: namely what one human being is able to do and achieve when he is a very old. At the age of over eighty, I consider this to be the last, great duty of my life. These thousands of ideas and dreams are part of it. Pessimist: every hour 6000 of our brethren and sisters die, closing their eyes forever on this planet. How can you be optimistic? Optimist: yes, but during the same hour 14,000 babies are born. In spite of death, scores of doctors and scientists all over the world continue to fight against death and suffering. Pessimist: yes, the 14,000 babies born every hour are a catastrophe: they contribute to the population explosion. Optimist: that explosion was due not to more babies being born but to less babies dying. The problem is now slowing down: less people will be born and a harmony will be established between life, death and the resources of this planet. Pessimist: you never give up. Optimist: yes, because I am a human. Dr. Robert Muller wears the golden cross given to him by Pope Benedict XVI after he helped arrange the pope's visit to the United Nations. Ask Robert Muller, the former assistant secretary general of the United Nations, for the key to dealing with life's biggest challenges, and he may offer an unusual suggestion: Smile. "That is the proper way to finding how to get out of the situation," he told the News-Press on Thursday. "I have had an incredible life with the decision to always smile, to always see the good side and think that the world, this planet, is a jewel in the universe." Dr. Muller, 84, was in Goleta giving a free talk at Friendship Manor, a seniors retirement facility, about his thoughts on peace, happiness and the lessons he has learned. Born in Belgium in 1923 and raised in the Alsace-Lorraine region in France, Dr. Muller has put his methods into practice even in the most harrowing of situations. A member of the French Resistance during World War II, he described an occasion when he hid in the attic while the Gestapo entered the building downstairs looking for him. Unable to escape, he decided to summon a smile and his happiest mindset to cope. "What is the thing that I should try to do, and which the Germans would never expect?" he recalled thinking. He smiled, walked straight downstairs, and told the Gestapo he had just seen the man they were looking for on the fourth floor. They raced upstairs while he rode away on his bicycle. "The Germans never saw me again," he said. After winning an essay contest in 1948 on how to govern the world, Dr. Muller began an internship at the newly created United Nations. He continued to work there for 40 years, rising through the ranks as he used his problem-solving ways in his approach to international projects. "The secretary general, when he had a problem and the people said, 'You have to solve this,' he would say, 'Look, go and see Robert Muller, he will find away,' " Dr. Muller said. "And I always found a way to help them out of the situation." Some of his achievements were personal, like getting two members who couldn't agree with each other to start working together. Others left long-lasting legacies, like the 11 of the U.N.'s 33 permanent missions that he worked to create and his world core curriculum, now taught in at about 30 Robert Muller schools around the world. Dr. Muller also serves as chancellor of the University for Peace created by the U.N. in demilitarized Costa Rica. Dr. Muller began imparting his ideas for happiness to his children, who asked for his advice as they made decisions about what to do with their lives. Eventually, he decided to publish them to share with others. 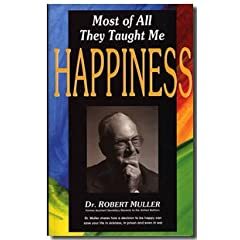 In his book "Most of All They Taught Me Happiness," first published in 1978, Dr. Muller described lessons he learned from the United Nations as well as from nature, other people, and his adulthood, and described how to be happy even in prison or in times of war. He has worked on his latest book, "Paradise Earth," with local resident Douglas Giles, gathering all his ideas and describing how they relate to his ultimate goal -- an Earth where everyone can live in harmony. Dr. Muller acknowledged that he sometimes gets discouraged by the world's problems. But even when it isn't easy, he said he reminds himself to turn to happiness for the hope of a solution. "You have to do it in the total possession of your being," he said. "And you have to believe that it is possible while it looks impossible." There are infinitely more people in the US supermarkets than in nature and in churches. Where will this lead when multinational business will have invaded the entire world? The human race is probably the most optimistic species on Earth: we believe we can unlock the secrets of Creation, augment life, prolong life, suppress disease, establish justice, provide happiness, reach peace, prosperity, morality and even communion with God. Our latest belief is that we will be able to manage our air, waters and land resources and establish proper planetary governance. My own belief is that we will be able to transform our planet into the Planet of God, into paradise even if only a temporary one in the multibillion years of evolution with its glacial periods. We must make this our firm objective for the third millennium. The examination of an airline magazine is sufficient to judge the strange and abnormal forms of human evolution on planet Earth; for example the innumerable 'inventions' of new objects and techniques, aimed primarily at being sold and bringing in money, while being detrimental to our lives and to the environment. Unfortunately the United Nations is not allowed and not equipped to deal with this problem. Optimists are strong people, pessimists are weak people. This world is a mountain, in which your works are echoed back to you. I love to write beautiful things and dreams. And what is astonishing is that they often become a reality! Optimists are far greater realists than pessimists because in spite of many errors, obstacles and setbacks, humanity does not cease to progress, largely thanks to optimism. "A thousand years hence, perhaps in less, America may be what England now is. The innocence of her character that won the hearts of all nations in her favor may sound like a romance and her inimitable virtue as if it had never been. The ruins of that liberty which thousand bled for or suffered to obtain, may just furnish materials for a village tale, while the fashionable of that day shall derive the principal and deny the fact. When we contemplate the fall of empires and the extinction of nations of the ancient world, we see but little to excite our regret than the moldering ruins of pompous palaces, magnificent monuments, lofty pyramids and walls and towers of the most costly workmanship. But when the empire of America shall fall, the subject for contemplated sorrow will be infinitely greater than crumbling brass or marble. It will not then be said, "Here stood a temple or here rose a palace of sumptuous extravagance, but here, a painful thought, the noblest work of human wisdom, the grandest scene of human glory, the fair cause of freedom rose and fell." "The wise only possess ideas; the greater part of mankind are possessed by them." An athlete who wants to win does not pessimistically think of defeat. If he did he would not win. The same is true of life and humanity. I do not have to dream what is possible or what I can implement. My dreams can induce other human brothers and sisters to implement them. They might live at a time when it is easier and when humanity has become ready and receptive to our dreams. in His boundless loving arms. YES, THIS IS A WONDERFUL IDEA. I AM STILL LOVING LIFE AND IT'S INHABITANTS IN UKRAINE. "Dear son Robert, many years ago, twenty-seven years ago to be exact, you wrote a beautiful book Most of All, They Taught Me Happiness, which contains very moving stories, for example, Grethel and your first cherry tree. It brings tears to my eyes. Why don't you give up all your books, speeches and efforts for a better world and write beautiful, simple, heart-warming stories again?" Dear Mother Earth, I will consider it, but I try to get a better world in which you will not be destroyed and children born today will not repeat the errors and neglects of their parents and forebears. It is an attempt of a new progress of the evolution of the human species on the planet bearing your name. How do you think God would govern the Earth according to the various religions we have on our planet? How would planet Earth govern itself without intervention of human beings? A collection of such essays might be quite interesting. When I see all the human wrongnesses around me on this beautiful, miraculous, life-endowed planet I think that in all 191 governments on Earth there should be a Ministry of Wrongnesses. Which will be the first country to create one? It would remain a landmark in human and in the Earth's history. One has to pay a toll of 100 colones to drive by car on the road to the airport. That is a small sum of 25 US cents but who thinks of the numerous of tons of additional gasoline used around the world to restart stopped cars at all the innumerable tolls around the world? I am one of the few ones, but no one listens to my requests that all road tolls in the world should be abolished. I recommend that the United Nations Environment Program publish every year a list of human actions which are unnecessary but do damage to the world's natural environment. I was fortunate to work all my adult life in the House of Hope: the United Nations. If there is one place on Earth where one can never give up hope it is the United Nations. I will do one thing every day to make peace grow like a flower. I will care for and not destroy the environment. I will solve my arguments peacefully without violence. Every day I will spend five minutes reflecting peacefully. Even with the existence and efforts of the United Nations and its 32 world programs and agencies our planet and humanity are totally and dangerously ungoverned: this will lead sooner or later to irreparable destructions and severe catastrophes. There are innumerable successes humans can achieve in the world. They can be ranked in different orders of merit according to our beliefs and values. For me at this stage of our evolution, achievement of peace, avoidance of wars, demilitarization of all countries and destructions of all armaments should be the top values and wonderful achievements. We can see a bottle half full or half empty. I can say: I have only so much time left, or I still have a lot of time left to live. Our approach to gratefulness has to be big enough to embrace all the difficulties of the world. Never despair. If you do, you cannot give your best. Your marvelous body, its myriads of cells and mechanisms need encouragement and hopeful guidance from the center. This applies as well if not more, to the infinitely more complex human society. June 30th is the last date for submission for this year Prayer. Peace ! Ukuthula! Salaam! Shalom! Vrede! Shanti! Ixolo! Pax! Pace! Old age and dying are quite normal. By nature they are fundamental. What a human can leave to his descendants are his wisdom, the lessons he has learned from life, contributing them to a better world, to humanity's next phase of evolution. I am trying to do that with these ideas. I would be ready to go to the end of the world to proclaim my hope and faith in humanity. The sin of inadvertence, not being alert, not quite awake, is the sin of missing the moment of life ? live with unremitting awareness. Infinite more attention should be given to art and culture which inspire, enhance, validate a civilization. It would be better to give grants and subsidies to the restoration of small, beautiful houses and villages from our past than to big housing corporations building soulless identical dwellings contributing to the further growth of monstrous cities. Hope is the antidote to the impossible. One of the world's famous environmentalists, Dr. Geraldo Budowski, retired like me at the UN University for Peace in Costa Rica, keeps repeating to me: "Robert, all your efforts, dreams and plans will lead nowhere. Humans and governments react only in the face of disasters. There are too many people busy changing this world and too few changing themselves. Think what a difference it would make if 6 billion people changed themselves into peaceful, kind, loving and hopeful citizens of this planet! "Dear Robert and Barbara, thank you for all the great work you do. I hope you remember me as I once had dreamt of you and you told me I was ready for world work. Since 1980 I have been advocating for children for having their voice in their own future as well as developing educational programs around the world that further children uniting. These programs stress global awareness as well as offering experiencing spiritual process for furthering world peace. Please look at my website?Garner, India, Thailand and more. Now off to the Palestinian area to set up a peace academy for youth there. It never stops. The whole of humanity is evolving upward. We must be co-evolvers in it. There is hope, incredible hope for a peaceful, better humanity and world. We are entering an entirely different new millennium. We are the ones for whom we have been waiting. [GMW #1226] Living Long Beautiful Lives - Humans, Other Species And Nature Too! We humans have done a pretty good job of extending human life: in the Roman Empire humans lived an average of only 24 years. In 1850 the average American died at age 45. By 1900 that age had grown to 48. In 1994 there were 40,000 centenarians in the United States. By the year 2020 there are expected to be more than 250,000. Even some of the most conservative medical researchers concede that right now the human lifespan could be as much as 120 to 140 years if we reduced the number of deaths from cancer and heart disease. When I look at all the magnificent, miraculous nature around the UN University for Peace in Costa Rica and our own finca next to it filled with nature I just cannot imagine that the current humanity considers itself superior to nature with her inventions, cars, airplanes, nuclear energy and weapons, etc. We must be crazy to believe that. We must absolutely redress the truth because with our superiority we are destroying nature and her innumerable species, which it took millions of years to form. Currently we destroy a species every five hours on planet Earth, a total estimated from 6,000 to 8,000 by the year 2050. We very much need Universities of Hope and Ministries of Hope on this planet. when the heart is open. American's increased water consumption is healthy, doctors say, but the plastic bottles aren't. Last year alone, more than 93 billion plastic water containers wound up in US landfills. Placed end-to-end, that's enough bottles to reach the moon and back 38 times. Nationally, the clear plastic bottles dumped into landfills annually could provide enough recycled material for 3.3 billion ski jackets or 546 million sleeping bags. California's Conservation Department is offering holiday shoppers an online national 'green gift guide' that it hopes will encourage consumers to recycle and buy recycled products, spurring more use of recycled material by manufacturers. "It's part of closing the loop," says department director Darryl Young. For example, L.L Bean offers Adirondack chairs made from recycled plastic jugs. My comment: we need many statistics like that for the entire world. My question: what will it be in a hundred years from now? For many years on this Earth I have not found a theory, a science, a literature, an art, a methodology, a book of recipes of hope. I hope that the Center for a Science of Hope will fill that gap. two, that we as humans really are connected. It is through our connection with others that we will find our answers. what a gift that you both are on this planet!! I feel that it is responsible of me to believe, to advocate and to show ways for the human species to govern well planet Earth. I should devote myself entirely to that important task of the survival, further evolution and success of planet Earth. Where there is no hope, the nature of a human changes. Where hope ends, despair and decadence begin. Since you cannot escape from this planet, you might as well enjoy it. I want all those who hear me or read me to feel better, more elevated, more hopeful, more human. I want to share with others my enthusiasm, my hopes, my happiness, my optimism and passion for life. Secretary General Kofi Annan is so right when he requests a total rethinking of the UN for the 60th anniversary of the UN in 2005. The first attempt at a better world order was the League of Nations, which was conceived by the United States. Alas, the US Congress did not allow the US to join it and World War II could have been, if it had. Today the UN is welcomed by most people of the world, but not all. Although created on the soil of the US this is particularly the case of that country. Hence the need for a total rethinking and progress of a 60 years old world organization. Consideration should also be given that the United Nations should be located in a first universal city of the planet. Hope is a great medicine of life. It should be studied scientifically and taught in Faculties of Medicine. To live content with small means; to seek elegance rather than luxury, and refinement rather than fashion....In a word, to let the spiritual, unbidden and unconscious, grow up through the common. This is to be my symphony. Like the indigenous peoples of the world we should always consider nature as number one. Alas we seldom do it and as a consequence our future might be fatal. Hope like love is a tremendous healing force. Use it generously. It is marvelous and a protection to remain a child all life long. Never cease to be a child. One of the most beautiful epithets I have been given is that of 'a wise sage with the heart of an innocent child'. There is no false hope. Any hope helps. The journal, the story of your life is your supreme gift to yourself. Keep it on your night table and open it often to elevate, to enrich your life and your place on our magnificent Mother Earth. You who have been admitted to the miracle of life, never lose hope. Even if you have a lot of work to do, if you think of it as wonderful, and if you feel it as wonderful, it will transform into the energy of joy and fire, instead of becoming a burden. We must never cease to be the Planet of Hope. Having listened this morning to a most beautiful classical Italian music by Botticelli I am wondering if Italy could not contribute again to the world a great artistic renaissance of writers, authors and artists of all classes. The current scientific, materialist and politicized humanity urgently needs a great artistic renaissance. Please dear Italy, do it. John Denver visited me at the University for Peace in 1987 to tell me that he wanted to undertake a world tour of singing for hope. "The lack of hope of young people worries me deeply," he said. "Hopelessness can lead to despair and despair can lead to disaster and collective suicide, such as war." Another singer told me during the Second World Parliament of Religions in Chicago in 1992 that he wanted to launch a series of world songs of hope under the auspices of UNESCO. For one peacemaker in the world there are at least 100,000 war makers, soldiers and manufacturers of armaments. How can we then hope for peace? "You who enter here leave all hope." "You who enter here never leave hope." Good Morning Robert and Barbara! You may not remember me, but my name is Chuck LaMark! I met you while working with Betty Williams a few years back. I will always remember your passionate presentation at UNESCO in Paris and our conversation about you life in northern France. Wishing you and your lovely wife peace and happiness! I am more than an optimist: I am an enthusiast (en theos, in God, by God possessed) for life. If God is life, then my love for life will bring me closest to Him. Nothing prevents us from dreaming leaving ourselves in a peaceful, disarmed, just, happy world. Perhaps starting to dream positively and writing down our dreams could contribute to achieving our objectives. Reading them or listening to them the next generation might implement them. Hope creates the image of the desired result and thus opens the corridors of the mind to the means of its achievement. I have great memories of you at the Brahma Kumaris Ashram in India many years ago during the Million Minutes of Peace campaign. And in June 99 for Arvol Looking Horse's Peace event as well as the last time I saw you play harmonica at the UN event with the World Peace Prayer Society. You are a man of wisdom and we honor your work for peace. See my blogs and info below.